Since I decided to embrace a Vegan lifestyle, I have really enjoyed cooking different foods from home. 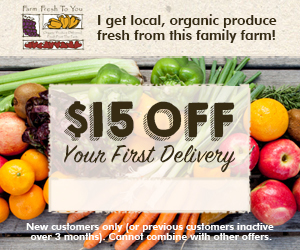 I have especially enjoyed using the produce from Farm Fresh to You. Since they are local, organic, farmers in CA, it's so easy to get super fresh fruits and vegetables when I need them. I like that I can schedule my organic produce delivery, customize each of my boxes, they have different box levels to fit your eating habits, and they leave them right outside your door. If you live in an apartment or condo with gate access required, they can make arrangements with you too so that you don't miss out! They also deliver to your office. There is always celebrations happening in the office; birthdays, promotions and holiday parties. This week I decided to share with you an update on my experience with Farm Fresh to You and what I received in my boxes. If you use Farm Fresh to You, let me know what your favorite fruit or vegetable is in the comments below. I have tried some vegetables that I would have never tasted if they were in the grocery store. For example, bok choy and chard, I get these all the time when they are in season. Disclosure: This post has affiliate links. Any purchase you make using these links supports this blog. Thank you in advance! Vegan Diet For Beginners: Adopting A Vegan Diet For Weight Loss & Good Mental Health!